In Windows, System Restore is of our first priority, if our system is not working properly. We can easily restore it back to the point when it was working as expected. Please close System Restore and try again. In case if the issue still persists, try the below mentioned registry manipulation to finally get rid of this error. 1. 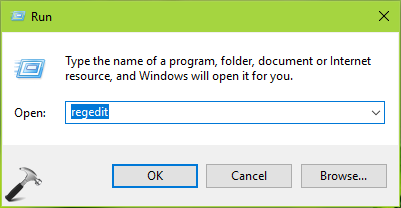 Press + R and type regedit in Run dialog box to open Registry Editor (if you’re not familiar with Registry Editor, then click here). Click OK.
4. Finally, set the Value data to 1 and click OK. Close Registry Editor and reboot the machine. After restarting your system, the error will no longer appear.